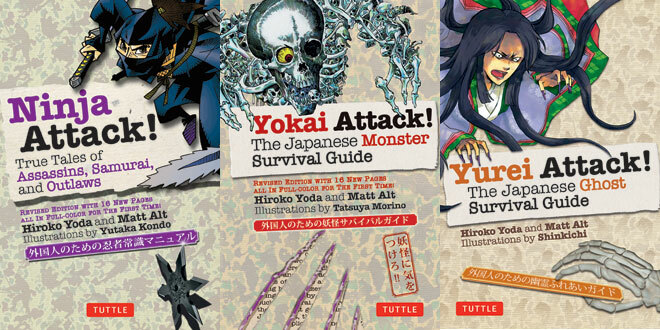 Earlier this year I got a nice surprise in the mail: Tuttle Publishing sent me three books: Ninja Attack!, Yokai Attack!, and the new Yurei Attack!. The books were written by Matt Alt and Hiroko Yoda, a husband and wife team who run AltJapan, a localization company that translates books, movies, and video games between Japanese and English. You might also recognize Matt from his contributions to Néojaponisme, including his taste-testing efforts on the Oh! Sake! series. Their Attack! books are all about demons, ghosts, and monsters in Japan. Given all that, who better to talk to with for Halloween? 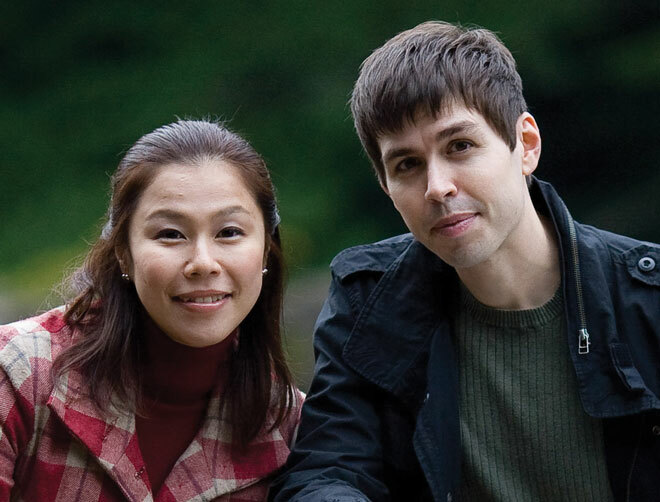 I chatted with Matt and Hiroko about their new book, difference between ghosts in Japan and the west, haunted real estate, and more. It's a little ironic that you two have this reputation for writing books about the supernatural, considering you started out with Hello, Please!, a book about kawaii characters. How did you discover your mutual love of the supernatural? Matt: It's even more ironic when you consider my interest in Japan came mainly through robots! The Shogun Warriors, Mazinger Z, Chogokin, the Transformers, Macross, Evangelion . . . you name it. I even helped run a Japanese robot toy site called ToyboxDX for many years. I've always loved giant monsters like Godzilla too, though, and there's some definite cross-over with supernatural monsters there. But I really owe my interest to Hiroko. Hiroko: I've always loved yokai stories and ghost stories. Ever since I was a little girl, I loved them. So Yurei Attack! feels like something I'd always wanted to write. Hello, Please! is all about anthropomorphic mascot characters. When we were writing it, we wanted to go deeper than just running a bunch of cute pictures for laughs. It's so easy to pick things from Japan and say "oh isn't this weird?" But we wanted to ask: "why? Why are there so many mascot characters in Japan?" Japan isn't like the West; we have a polytheistic, animistic belief system, not the monotheistic one of the Judeo-Christian tradition. Polytheism and animism fueled the concept of the yokai. Many yokai are anthropomorphic objects, everyday things with faces and arms and legs, just like many mascots are. So there was a natural connection. The subtitle of your book is "The Japanese Ghost Survival Guide," but yurei are a little different from ghosts in the way that we understand them in the west. What sets yurei apart? Matt: The core concept is almost identical: the soul of a dead person who for whatever reason decides to stick around here instead of going to the hereafter. That much is the same. But you're right in that the stereotypes of what Japanese consider a yurei are very different from what Westerners associate with ghosts. In the West, the guy-under-a-sheet is for whatever reason the dominant image of a ghost. But in Japan, there's a more specific array of characteristics: long, unkempt hair; dangling, limp hands; and most importantly, a lack of feet. Hiroko: My impression, looking from outside the USA, is that ghosts in the West have more physicality to them. They're "there," flesh and muscle and bone, like you can almost touch them. But ghosts are much more ambiguous here in Japan. I don't feel like they have any "density," it's way more subtle than that. Like a wind that passes by and then disappears, leaving only a feeling behind. Japanese ghosts are almost poetic. That's what attracts me to them. They tend not to be "in your face" like portrayals of Western ghosts. Well, the angry ones are in your face, I guess, but the point isn't their presence — it's the fear. 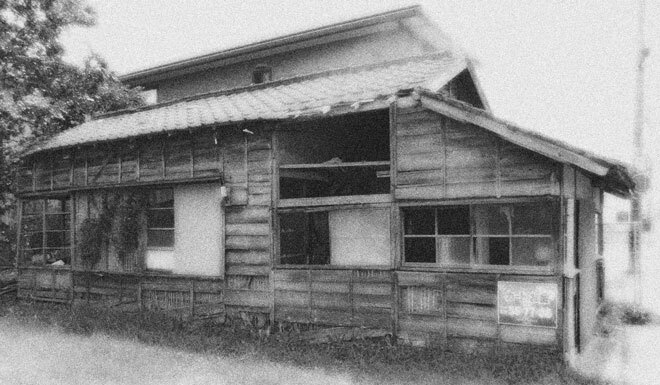 Matt, you mentioned in an interview that some realtors in Japan actually play up the history of wake-ari bukken, or "troubled homes." How else are people in Japan today embracing yurei? Matt: Yes, "wake-ari bukken": real estate listings with problems. Most of the time realtors try to play things like suicides and murders down for obvious reasons, but they are required by law to disclose them. We found one or two places that play it up, openly disclosing that their listings have troubled histories and that you can save money by renting them — if you dare. Hiroko: There are actually a whole list of problems that realtors are required by law to disclose, and one of them is the presence of an old, sealed-up well on the property. Kind of like The Ring! I guess my timing for this interview is pretty bad — I've seen you two mention in several places that summer is the season for yurei in Japan. Are there any yurei that are active in the fall? Hiroko: Summer is definitely ghost season in Japan. That's when Obon, the festival of the dead, when people welcome the souls of their relatives back to visit. But when the lid of the underworld lifts off to let them out, lots of other creepy things slip out too. So they say. But there's no rule or anything. Just because summer is yurei season doesn't mean they aren't around at all during the other months. For instance, the Futon of Tottori is an old legend about a bed haunted by two children who died in the cold of winter, and that's when they appear. I really love the illustrations in Yurei Attack!, especially the giant, gory collage of hell. They're all done by Shinkichi, a doujin artist. How did you end up working with Shinkichi? Hiroko: Shinkichi is an old friend of ours. We met at an art exhibition dedicated to a yokai called the kappa. A bunch of our friends always contributed pieces of kappa-related art to the show and we were invited to join too. So that's how we became friends. Matt: She's also a very active dojinshi artist and so I would visit her table at Comic Market and other places. She asked us to contribute to one of her comic compilations, and so there was this history of collaborating together. We have a lot of manga artist and anime industry people in our circle of friends, so these collaborations tend to happen pretty organically. Yokai Attack's Morino-san and Ninja Attack's Kondo-san were friends of ours long before we worked together. Hiroko: The one I have the most respect for is the tale of Oiwa, from the Horror of Yotsuya. The story is centuries old, but she's just as well known and feared today as she was when she died. Both seriously, and as an inspiration for entertainment like horror movies (she's a direct inspiration for Sadako, for example.) That is really amazing. You have to respect that kind of longevity. Matt: Definitely — supernatural "mindshare!" For similar reasons I am fascinated by Masakado, the ghost of one of Japan's first samurai. His head is buried in a little plot in the middle of downtown Tokyo that remains a shrine to this very day. Nobody will disturb it, even though it represents some of the most expensive real estate in the country, maybe even in the world. Nobody will disturb it because they fear and respect the curse of Masakado — and that's really saying something in a country as advanced and scientifically oriented as Japan. So in a very real way, ancient ghosts do affect the way people go about their lives in the modern day too. Are you working on any new books right now? What can we expect out of AltJapan in the future? Matt: Actually, the books are sort of a hobby for us. We make our living in localization: producing the English versions of Japanese video games and manga. That's our main gig. We translate, handle recording of voice actors, things like that. So you can expect to see a lot more translated games, comics, television shows, and things like that from us. Hiroko: Over the last few years we've branched out into doing European languages as well. We're working on several great titles for the PlayStation 3 right now that we can't announce just yet but are really looking forward to being able to talk about in the next few months. Is this the end of the Attack! series, or can we expect more supernatural beings attacking us? Matt: Well I can tell you that we are prepping ebook versions of all three titles in the series, which is what we're focusing on right now. They should be available in a few months. Hiroko: We'd love to do more books in the series! We don't have anything we can announce just yet, but we're always looking for a new excuse to tangle with yokai, yurei, and other things!